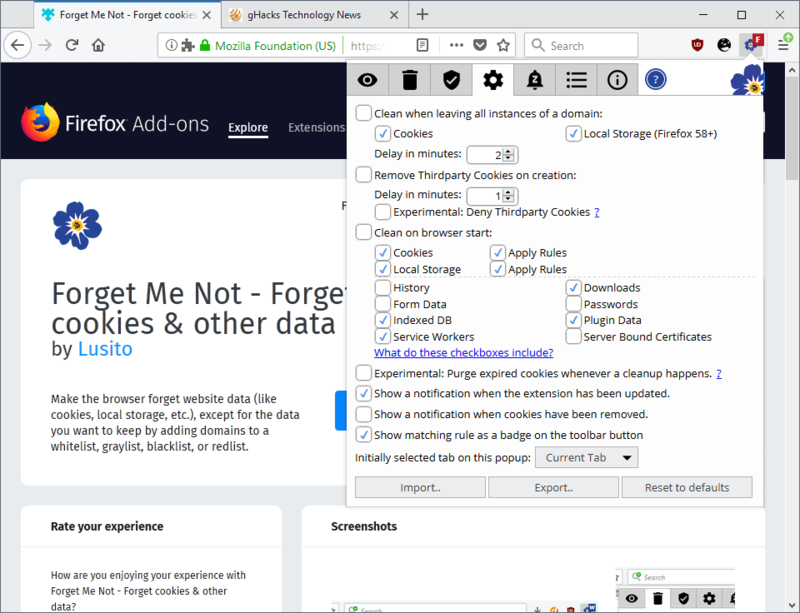 Forget Me Not - Forget cookies & other data is a browser extension for the Firefox web browser that gives you full control over data such as cookies that websites save to the local system. The extension supports three main features: clean data automatically, manually, and create custom rules for domains. Forget Me Not won't act on its own after installation; this means that it won't delete any cookies after installation and that you need to configure it so that it does what you want it to do. A click on the extension icon opens the configuration interface. It is divided into several tabs and the first tab you may want to open is the settings tab (the cogwheel icon). You configure the program's automatic behavior there. The three core options that it provides are to clean data when all sites with connections to a domain are closed, to remove third-party cookies automatically on creation, and to clean data on browser start. While you can configure Firefox to run some cleanup operations as well, the options that Forget Me Not offers can be combined with the rules system the extension support. You can whitelist and blacklist domains so that cookies are kept or blocked from being set for specific sites. Forget Me Not supports two additional rule types. Gray rules are allowed to save cookies but they are deleted automatically by the extension on browser start. Red rules override white and gray behavior, but not blacklisted behavior. The creation of new rules for domains is a straightforward process. Click on the extension icon when you are on the domain that you want to create a new rule for. The new rule tab is opened automatically, but you may use the "recently visited" tab as well to create rules for sites you visited recently in the browser. Select the "add new" button to create a new rule for the domain. the extension uses *.example.com by default. You can use * as a wildcard, *.google.com would include all google.com domains, and the expression www. *a.com would include all domains with an a at the end of the domain name. Select the type of rule, e.g. whitelist or blacklist. Optional: define third-party cookies handling. The icon of the extension indicates the active rule if it exists. The last option that Forget Me Not offers is to clean up data manually. You may use it to clean cookies and local storage, as well as history, downloads, form data, passwords, indexed DB entries, plugin data, service workers, and server bound certificates. Rules are applied automatically for cookies and local storage, but you can disable that so that everything is removed when you run the cleanup. you may configure the extension to run cleanups automatically, or run a manual cleanup at any time from within its interface. Forget Me Not supports a couple of extra features that you may find useful. One interesting feature is the ability to delay the cleaning of third-party cookies and when exiting sites, another that you can enable the deletion of expired cookies. The extension supports a snooze feature which freezes it as long as snooze is enabled. 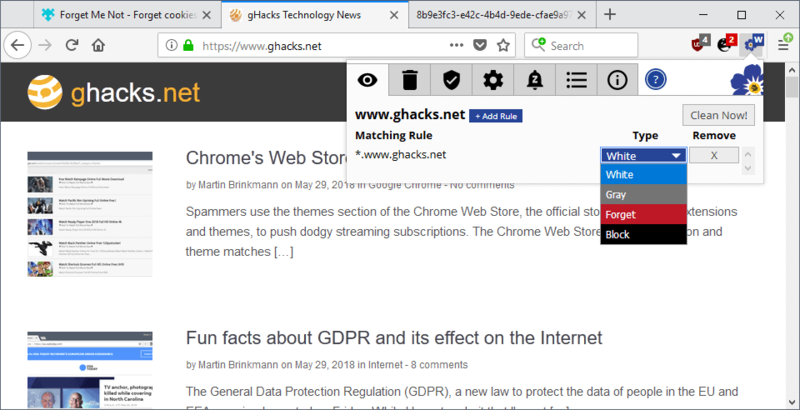 Forget Me Not - Forget cookies & other data is a well designed extension for the Firefox browser that gives you full control over cookies, local storage and other browsing data. It is like Self-Destructing Cookies (legacy) or Cookie AutoDelete (WebExtension) only better as it provides more customization options. While you may spend some time creating rules in the extension, doing so is well worth it in my opinion as you will end up keeping only the cookies and data that you require. Love the new privacy focused, power-user minded addons that Mozilla has been making lately. Looks like all hope is not lost for Firefox Quantum. I’ve been using the ‘Cookie AutoDelete’ Firefox extension ever since Firefox 57 but, after through testing ‘Forget Me Not’ seems to me preferable. A new life (but ‘Cookie AutoDelete’ and I stay good friends, lol!). ‘Forget Me Not’ includes blocking sites when, with ‘Cookie Autodelete’ I had to use Firefox’s ‘Cookie and Site Data’ /Exeptions. ‘Forget Me Not’ provides a full user data cleanup on demand, which allows me to remove the ‘Clear Cookies and Storage Button’ extension. I’ve moved back to the ‘Cookie AutoDelete’ Firefox extension. Why? In other words, with ‘Forget Me Not’ if a user sets a site as ‘blocked’ then only the site’s cookies will be blocked but not the site’s data in user’s localStorage (webappstore.sqlite) nor in his indexedDB storage (a site’s data folder appearing in user’s profile/storage/default folder. But if that site is added to Firefox’s ‘Cookies and Site Data’ exception list, then the site’s data is blocked : cookies and localStorage and indexedDB storage. In terms of privacy this is not good: if I block a site’s cookies it means all “cookies”, that is all data and not only the classical well-known cookies. It’s become a natural fact for many sites to lay their data in users’ localStorage and/or in his indexedDB storage. I see no need to have a site lay whatever on the account it saves bandwidth and time when connections are faster and faster, when local disks are more and more powerful: Truth is storage is the new masterword for many sites enabling them to counter users’ cookie policies which are increasingly aware of related privacy issues. Does it support containers like Cookie AutoDelete does? Good question. I don’t know because I don’t use Firefox containers. What I can say is that there is no container specific option in ‘Forget Me Not’, but maybe is it active by default as it is with ‘Cookie AutoDelete’ (which has an option to disable container support). Strictly FF by the looks of it and won’t work to clear local storage on Waterfox or Basilisk. Not that that’s a problem mind you since Self-Destructing Cookies which is a legacy addon will perform that task on both of the above mentioned browsers. Does this Forget me not cookies WebExtension has an option that when you close a tab the cookies concerning that tab are cleaned/removed? Do I understand it correctly that when you close a tab and the cookie stays there all the browser behavior is still picked up, up to the next startup from Firefox? When is this the case is it not wiser to use Cookie AutoDelete because this WebExtension deletes all cookies automatically that sites and applications have set in Firefox when you close tabs in the browser? Answer : yes. You choose a default action policy and per-site policies. If your default policy is “Forget’ then cookies, by default, will be removed after a delay which is as well the user’s choice. In fact it’s the same logic as Firefox’s native cookie management. Same with ‘Forget me Not’, same logic. What does the default red F (Forget) option do? Default red F in ‘Forget Me Not’ means that sites’ cookies are deleted once they’re closed. That’s the default setting. From there on site specific settings are of course available : the user may wish to keep a given site’s cookies for the session only or for always, or even block cookies for that given site. All this is explained on the extension’s AMO page. the less addons the better. this addon delusion is insane. firefox offers per se protection -> about: preferences # privacy -> block cookies and site data. if cookies/site data are really needed (for example, to log in to a page (youtube, gmail .. et cetera)) -> context menu -> view page info -> permissions -> set cookies – allow. so you have full control and functionality. it will be only a few pages, which require this process. You raise a good point, but for the few websites that do require cookies to operate, why not have an extension to automatically delete the cookies once the site is closed? Is that not a useful feature?